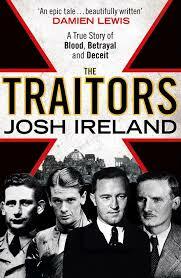 Josh Ireland’s book, which focusses on the notorious “Lord Haw Haw” (William Joyce) and three less well known traitors does the job. The most interesting of the group was Harold Cole, who spent the war pretending to be a British agent operating in Nazi-occupied Europe, weaving his way into the confidence of the French resistance, while betraying scores of patriots to the Germans. While the two main protagonists of the book, Joyce and the infamous John Amery, son of a British cabinet minister, were hanged following trials in London, Cole was killed in a gun battle in the Paris flat where had been hiding. One of the saddest things about these stories is the fate of the women who came into the lives of these traitors. Many of them were used (the Germans would offer up local girls to lure British prisoners to sign up to the Nazi side), many others were betrayed, and some suffered the fate of falling in love with the wrong man. My one gripe about the book: the authors fails to mention West’s pioneering work, which was based on her own experience watching the treason trials in Britain.